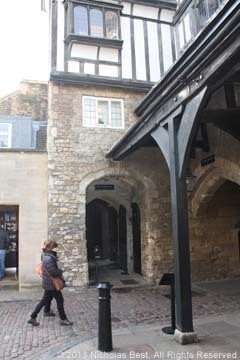 This is the Byward Tower at the Tower of London. It was royalty’s private entrance to the fortress. 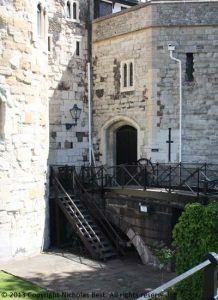 The royals arrived by boat and were welcomed by the Lieutenant-Governor before being escorted across the moat to the little postern gate, which opened to receive them. On 29 May 1533, King Henry VIII stood here, waiting impatiently for Anne Boleyn, his new Queen, to arrive from Greenwich. By tradition, she was to stay in the Tower for two days before going to Westminster Abbey for her coronation. It was a lavish procession from Greenwich. Henry had insisted on a good show. His divorce from his first wife had not been popular, so he wanted to make a spectacle of Anne’s coronation to provide everyone with an excuse for a party. Anne’s boat was escorted by a flotilla of 50 barges, stretching almost four miles along the river. The boats were all decked out for the occasion, with minstrels playing on board and everyone in their best clothes. Anne herself, although six months pregnant, was ‘apparelled in rich cloth of gold’. Her hair, dark and luxurious, stretched down her back almost to her waist. She was a glamorous sight as she stepped ashore at Tower Wharf. A thunder of artillery greeted her arrival. The noise was so loud that it shattered every pane of glass in the Tower. Anne crossed the wharf to a round of applause from the nobility and officers of state, all of them anxious not to offend the King’s new squeeze. Henry himself was so delighted that he stepped forward and did something unprecedented in Tudor times. Defying all etiquette, he shocked everyone by taking Anne and kissed her in public ‘with loving countenaunce at the postern by the waters’ side’. Anne followed Henry into the Tower. Three years later, he had her beheaded there.